Maybe you get home really late after a super long day between work and shuffling the kids to school and back. You probably didn’t have time to exercise, and you definitely didn’t make it to a yoga class. In fact the very thought of a single Sun Salutation seems so daunting, that there’s really no way you’re rolling out your mat at home for a solo practice. Moreover, you’ve probably spent the bulk of your day sitting at your desk or in your car, and your hips have literally been trapped in a constant state of flexion. I’ve been working with yoga students who face similar problems and have come up with a few stretches targeted to release tension, remove exhaustion, and heal your body, so you can fall asleep peacefully and with ease. These three stretches are inspired by traditional Hatha yoga poses, and incorporate Traditional Chinese Medicine (TCM) and Resistance Flexibility Strength Training (RFST), a system that involves contracting a muscle while simultaneously stretching it. You’ll also stretch the same line of energy that an acupuncturist would target with needles, to access specific meridian points along the heart, stomach and thymus. Start on all fours, with your hands underneath your shoulders and your knees hip distant apart and toes untucked. Press down into your palms and into the tops of your feet. Think of scrunching the earth together between your hands and your feet and energetically squeeze your hands in towards one another, as if your thumbs could touch each other. Note that nothing will actually move, but energetically, try maintaining these actions with a high-level of resistance throughout this dynamic pose. 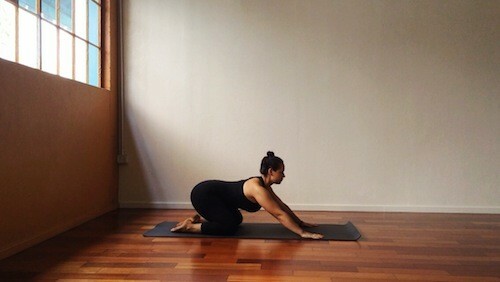 Keep pressing down into your hands and then draw your hips backwards towards a Child’s Pose. As you take your hips back, look up. Repeat 5 to 10 times. 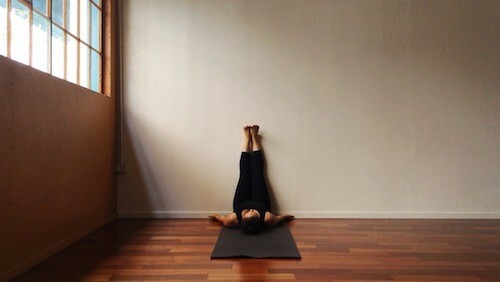 Lastly, release all the way into a Child’s Pose — Balasana. Reach your arms all the way out in front of you, and draw your palms together into a prayer. Bend your arms at the elbows, releasing your thumbs to the nape of your neck. Walk your elbows forward and towards one another, finding a tricep stretch and a release for your shoulders. This stretches the heart meridian, which runs across the front of the chest and the fronts of both arms. Your entire circulatory system will benefit from this Dynamic Child’s Pose, aiding in sleep disorders like insomnia. And since this stretch runs along the heart meridian, you will also tap into that part of yourself that is unconditionally loving. Start with a blanket and a bolster (or any cushion) against a wall. Come into a lunge with your knee on the ground and the top of your back foot against the cushioned wall. Press your back foot into the wall and maintain the 90 degree alignment of your front knee. Try thinking of dragging your front heel in toward the wall, activating the front hamstrings. Keep these actions in the legs, and then draw your hips back towards the wall. Allow your hips to come forward, and then repeat 5-10 times. This stretches the stomach meridian, traveling up both sides of the body — from the feet, up the fronts of the legs, through the torso, and up past the jaw. 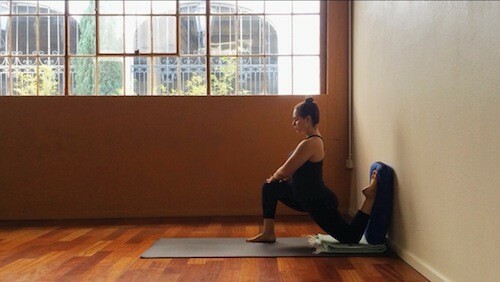 This stretch releases tension in the fronts of the quads and relieves jaw tension. If you grind your teeth when you sleep, this is an excellent stretch. Your digestion and metabolism will also benefit from this stretch along the stomach meridian. 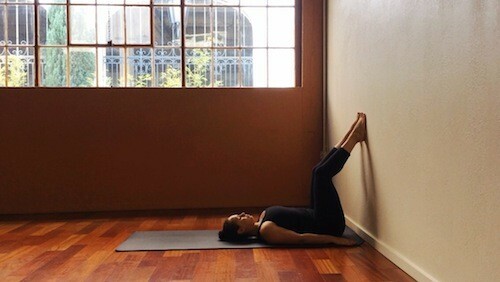 Start laying down with your legs up at the wall and your hips about 4-5 inches away from the base of the wall. Reach your legs long, and then bend your knees only as much as you need to in order to place the soles of each foot onto the wall. You will probably have a slight bend at your knees. Place your arms alongside your body and press down into the earth with the backs of your upper arms and shoulders and press forward and down into the wall with your heels. Keep these actions, and then tuck your tailbone by curling your pelvis upward, lifting your hips above your shoulders. Keep pressing into your upper arms and heels and think of lifting your hips higher as you slowly start to roll your way back down. As you lower, place your hands on your quads and press them upwards, adding another layer of resistance. From the top of your spine lower down one vertebrae at a time. Repeat 5-10 times. Lastly, scoot your hips closer to the wall and release your legs straight up or out in a wide V-shape — Viparita Karani. Stay here for as long as you’d like. This gentle stretch will work the thymus meridian, which runs from your fingers up the backs of your arms, shoulders, and neck, all the way to your temples. This stretch has tremendous healing abilities, and can alleviate pain in the upper, mid, and lower back, and in the upper traps and neck as well. Your immune system will be directly affected, strengthening your ability to recover from various illnesses or infections. 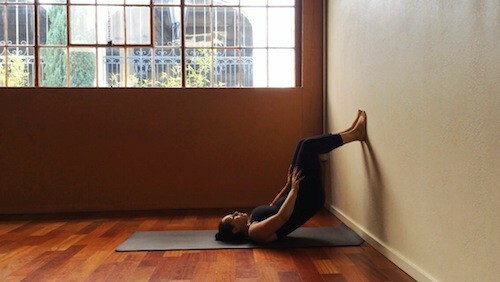 After this stretch you’ll be left with an overall sense of wholeness, which can be incredibly satisfying on multiple levels — physically, emotionally, spiritually, and psychologically. Justine is inspired by movement and the body, and her tremendous respect for the body is reflected in her teaching. She is certified to teach Yoga and Pilates, and she has also studied both Resistance Flexibility and Deep Bodywork Massage. Through her yoga classes, she strives to create a safe and playful environment for students to explore mind-body connection as well as develop a keener sense of awareness both on and off the mat. Justine teaches at Yoga Soup and is based in Santa Barbara, CA.